As 2015 narrowed to an end I had some leave days and wanted to do a DIY project. Naturally it included drawing, doodling and colouring type of features. I love journals, notebooks and activity books. Keeping these in mind I decided to design a Journal. Because I use my journal to capture my thoughts and ideas I wanted to be a thought collection journal. But I didn't like the sound of a 'Thought Collection Journal'. Scribbling for a little while I stumbled over "Think Tank' and woohoo!! 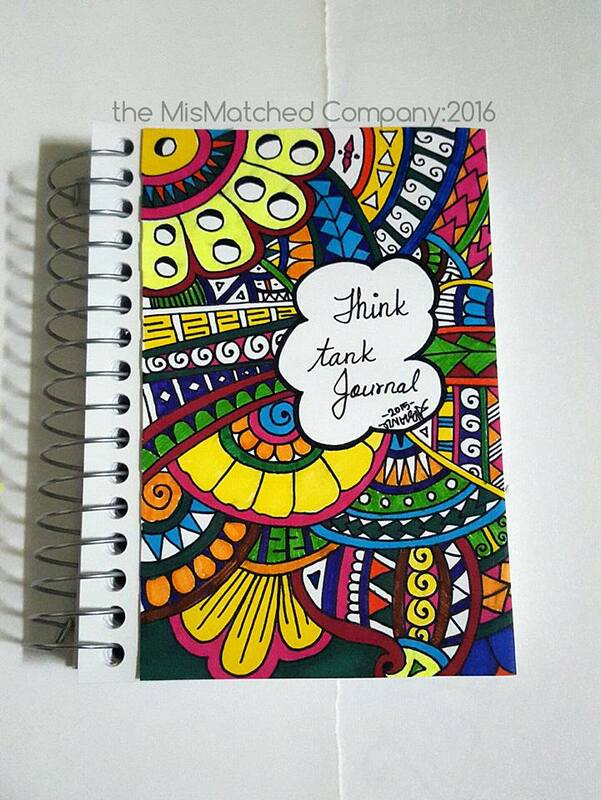 The Think Tank Journal was born. I designed one cover and loved it. I coloured it in and I was so happy with the end result. I went looking for a small notebook to put this cover on. This is when I realised that we don't have very many note-book options here in our book shops. We get the usual 'exercise books' that we use in schools but the hard cover note books (A6, A5 in size) or the fancy-full spiral note books. What happened to the book shops???? All the scavenging lead us to find very few note books. The search for the note-books were hard enough, the prices of notebooks gave me a mild heart attack (figuratively of course). Anyways I purchased a few different types of note books and brought them home. I covered them with my colorful designs and set to fill up the inside. 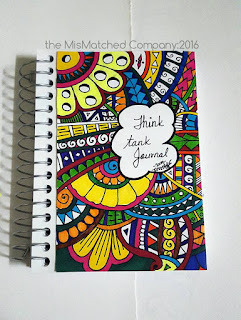 What do you write in a THINK TANK JOURNAL? Let's begin with Goal Setting. So in the first page I have allocated space to list three goals I want to achieve this year. And of course let's just be realistic. None of the 'New Year, new me' nonsense. Inspiration quotes. Google helped to search for some quotes that help to inspire and motivate us. I jotted down a few of the quotes on random pages. Fun Activity. I love doing little activities and documenting the results. So on a few other pages I listed down activities for FUN. Some of these activities include; (i) Take a silly selfie; (ii) Listen to a song from the 90's. Doodle Colour Time. No journal of mine is complete without some colouring fun time, so I draw some doodles for me to colour when I reach that page. You can follow me on twitter and instagram and tag me there as well. Or you can post your results on the MisMatched page. absolutely love the colors Eli!